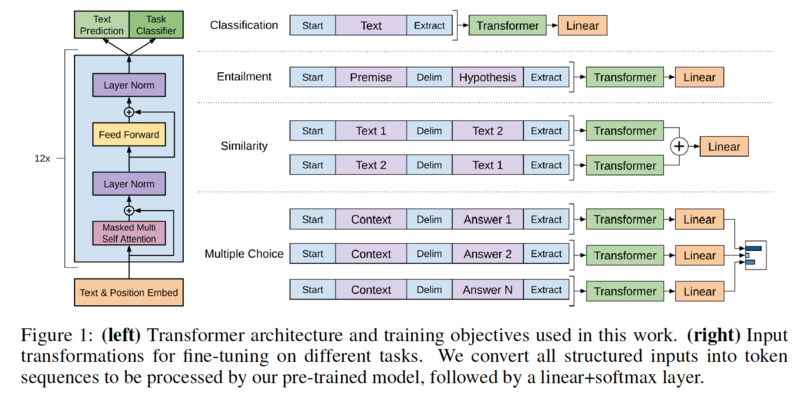 This is a PyTorch implementation of the TensorFlow code provided with OpenAI's paper "Improving Language Understanding by Generative Pre-Training" by Alec Radford, Karthik Narasimhan, Tim Salimans and Ilya Sutskever. This implementation comprises a script to load in the PyTorch model the weights pre-trained by the authors with the TensorFlow implementation. The model classes and loading script are located in model_pytorch.py. The names of the modules in the PyTorch model follow the names of the Variable in the TensorFlow implementation. This implementation tries to follow the original code as closely as possible to minimize the discrepancies. scheduled learning rate as commonly used for Transformers. You can download the weights of the OpenAI pre-trained version by cloning Alec Radford's repo and placing the model folder containing the pre-trained weights in the present repo. To use the positional encoder of the transformer, you should encode your dataset using the encode_dataset() function of utils.py. Please refer to the beginning of the __main__ function in train.py to see how to properly define the vocabulary and encode your dataset. The ROCStories dataset can be downloaded from the associated website. The single run test accuracy of this PyTorch version is 85.84%, while the authors reports a median accuracy with the TensorFlow code of 85.8% and the paper reports a best single run accuracy of 86.5%. The authors implementations uses 8 GPU and can thus accomodate a batch of 64 samples while the present implementation is single GPU and is in consequence limited to 20 instances on a K80 for memory reasons. In our test, increasing the batch size from 8 to 20 samples increased the test accuracy by 2.5 points. A better accuracy may be obtained by using a multi-GPU setting (not tried yet).